The date was set – 7th November to 11th November. Her chattels, her jewels, were removed for us before she was interred – her name plate, her life ring and her fibre glass fish lids are all being sent back to us in the UK. 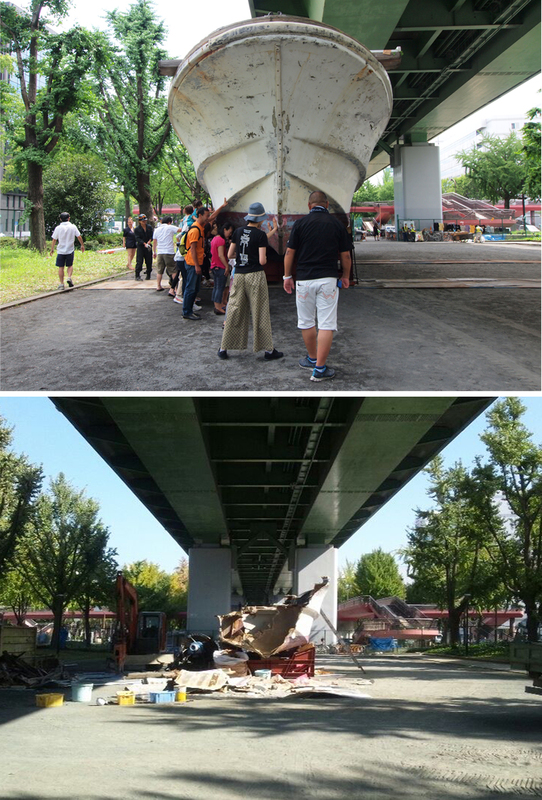 And so the boat has been destroyed, on the spot, where we all pushed and pulled and craned and drove her to in Nagoya. I blinked and she was gone. It is the 8th of November, the first day of destruction and she has already gone. I’m not sure if she was cut or smashed or what. It looks like she was bitten and crushed. One of the many things going through my mind now is this – that we or rather I don’t look back at a time before I was here and mourn this, but I do look to a time in the future when I will not be here and I mourn in advance for this. With the boat or more correctly at last I should call her a fishing trawler, we didn’t mourn a time before she was here, but we will miss her not being here and I worry about this. I can already feel the ache has begun. Are we afraid of a space that we cannot imagine, that emptiness means all that has happened will fade and is no longer important. It will fade, we will all fade and disappear, but the importance is not gone. I couldn’t choose exactly what her demise would be, I had wishes, a living will if you like, but as with most deaths the exact conditions and circumstances of that moment are unknown. Those in charge dealing with the transition do the best job that could possibly be done. Just as with a birth plan or any plan, plans rarely go exactly to plan, but another course of actions occurs, an unplanned plan. “I am really sad ” Taka said today and so am I, but I am filled with an incredible joy too. More connections and emotions have been bred. And more confirmation that in this world where all things will come to pass that we are all in this together somehow, Blast Theory with a tremendous group of people now from Japan and that makes our lives fantastic. Always grateful to Aichi Triennale 2013.